What Are My Mortgage Options in California? Tired of renting and ready to buy a home in California? Perhaps you relocating to California? Or, maybe you already live here and have decided it’s time to move up to a bigger home? 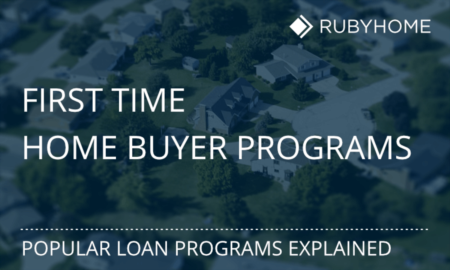 Whether you’re first time buyer or a seasoned homeowner, there’s a mortgage program (or two) that’ll meet your needs. This article includes everything you need to know about the types of home loans in California. The term, or duration, of most mortgage programs in California is 30 years followed by 15-year mortgages. Adjustable Rate Mortgages have the shortest terms and require borrowers to refinance their mortgage in the future to reset the term and rate, typically to a fixed-rate mortgage. The principal and interest (P&I) portion of your monthly mortgage payment stays the same for the life of the loan. Only taxes and insurance will change over time. According to California Association of Realtors’ market data report, 83% of loans in California are fixed-rate. And 75% of loans are on a 30-year term. Because the term (duration) of the loan is half of a 30-year loan, 15-year mortgages carry lower interest rates. You’ll save money by paying less interest each month. However, compressing that loan into a shorter timeframe simultaneously increases the total monthly payment. If you want a debt-free retirement and you are 40 years-old or older, a 15-year loan could be an especially good option. To summarize, you’ll pay off the home in half the time and with less interest expense. ARMs have lower initial interest rates that fixed-rate mortgages, which produces a lower monthly payment, assuming interest rates don’t go higher while you have the mortgage. Interest rates change over time, based on what the movement in the broader markets. That’s why ARMs are more suitable if you plan to live in a home for a only few years instead of 10 or 15 years. FHA loans are popular with first-time home buyers. They only require a 3.5% down payment, and FHA‘s requirements are pretty forgiving for borrowers with less-than-perfect credit. FICO scores down to 620 (and sometimes lower, depending upon circumstances) are allowed. FHA loans allow down payment gifts from blood or by-marriage relatives. Many first-time home buyers get started with a little financial help from their families. If you make a smaller down payment (less than 80% loan-to-value), an annual mortgage insurance premium (MIP) is required. MIP is paid monthly and tacked onto the principal, interest and insurance portions of the payment. To get rid of FHA mortgage insurance, borrowers must refinance into another type of loan, typically switching over to a conventional mortgage. FHA loans have a one-time, upfront mortgage insurance premium (UFMIP) at the time of closing. $679,650 ceiling in high-cost areas. The United States Department of Agriculture (USDA) offers mortgage insurance to borrowers with low and moderate incomes who live in rural areas. USDA loans are another zero down payment option. USDA does not specify a minimum borrower credit score. However, a borrower’s credit history will be reviewed, included non-traditional credit like rental history or utility payments. While no FICO score is required, lenders will want borrowers to demonstrate an ability to pay the loan back. Down payment gifts are allowed. Like other government-insured mortgages, USDA loans have an upfront guarantee fee at the time of closing. If the loan-to-value (LTV) is greater than 80% an annual, ongoing mortgage insurance fee will be included in the monthly mortgage payment. The California Housing Finance Agency (CalHFA) was established in 1975 to help low and moderate income Californians get safe and affordable housing. First-time home buyer programs in California include two down payment assistance programs that can be combined with standard mortgages. MyHome Assistance Program is a small loan (5% of loan amount) to help offset the down payment and closing costs for first time buyers. The loan is deferred; you don’t have to pay it back until the home is sold or paid in full. Zero Interest Program (ZIP) is very similar to MyHome above, but the loan amount is 3% of the total mortgage and carries 0% interest rate. ZIP repayment is also deferred. In the past, conventional programs required 20% down payment. The combination of higher credit score and down payment requirements earned conventional loans the reputation as being “out of reach” to most first time buyers. Today, conventional loans are more forgiving. In fact, the Conventional 97 and HomeReady programs only require 3% down. Borrowers need higher FICO scores to get a conventional loan than government-insured mortgages like FHA, VA or USDA loans. Folks need a credit score around 680, which is higher than FHA loans, which only require a 620 score. But at least there are a few more options on the table for borrowers with good credit but have limited funds for a down payment. Like their government-insured counterparts, conventional mortgages require mortgage insurance when the loan-to-value is greater than 80%. Conventional loans use private mortgage insurance (PMI). PMI goes away on its own, over time, as the LTV gets to 80% or lower. That’s a stark contrast to FHA loans which carry mortgage insurance for the life of the loan (borrower must refinance to get out of MI). Home prices in California are high compared to many states in the U.S. Borrowers here sometimes need a bigger loan, one that exceeds conforming loan limits. That’s when jumbo mortgages come in handy. Jumbo loans are available in amounts up to $3 million. How do you know if you need a jumbo loan? As listed above, $417,000 is the loan limit in most California counties. Loan limits in “high cost” areas in California can go up to $625,000. High cost areas include Los Angeles, Alameda, Contra Costa, Marin, Napa, Orange, San Benito, San Francisco, San Mateo, Santa Barbara, Santa Clara and Santa Cruz counties. Homeowners in California can repair or remodel a house using one of two types of FHA 203(k) rehab loans. The Standard 203k is for larger rehab projects, over $35,000. The Standard is used for things like structural repairs or adding another room to your house. The Limited 203k is for projects smaller in scope, less than $35,000. The Limited would be used for things like re-wiring, replacing an HVAC system, etc. Homeowners in California who are 62-years old or older can use a reverse mortgage to tap into the equity of their home while remaining in it. Borrowers cannot be evicted from their homes; the reverse mortgage loan only comes due upon a borrower’s death or when they move out. Reverse mortgages help elderly homeowners pay for expenses like healthcare, home improvements or emergencies. The equity can be paid in one lump sum, or borrowers may elect to receive monthly payments. Some refinance programs require less documentation and faster closing times, even eliminating the need for an appraisal. They are known as “streamline” refinances and they are available for VA, FHA and USDA loans. Whether you're purchasing or refinancing in California, there are many mortgage options. No doubt, there's one that will best suit your needs.